Location: Klondike Hwy #2, approximately 333 miles northwest of Whitehorse, 180 miles north east of Tok, Alaska, 113 miles northwest of Stewart Crossing. Population: 2,000. Visitor Information: Klondike Visitors Association, PO Box 389C Dawson City, YT Y0B 1G0; Phone: (867) 993-5575; Email: kva@dawson.net; Website: www.dawsoncity.ca. 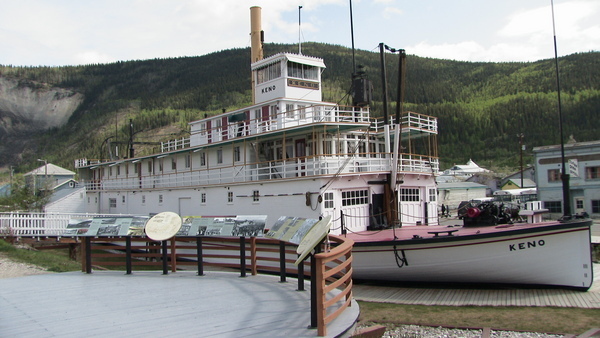 Visitor Information Centre, Phone: (867) 993-5566; Email: vic.dawsoncity@gov.yk.ca. Dänojà Zho Cultural Centre, Phone: (867) 993-6768; Website: www.trondekheritage.com. Situated at the confluence of the Klondike and Yukon Rivers, the site where Dawson City now stands lies in the heart of the traditional territory of the Tr’ondëk Hwëch’in First Nation. For countless generations, the Tr’ondëk Hwëch’in have lived and thrived here, resulting in an extremely rich history, which is passed on in a variety of innovative ways at the Dänojà Zho Cultural Centre. Located on the bank of the Yukon River across from the Dawson Visitor Centre, Dänojà Zho provides a focus for many cultural activities. Melding centuries of tradition and up-to-date interpretive methods, the Centre encourages visitors to explore the rich history, traditions and contemporary life of the First People of the Klondike. 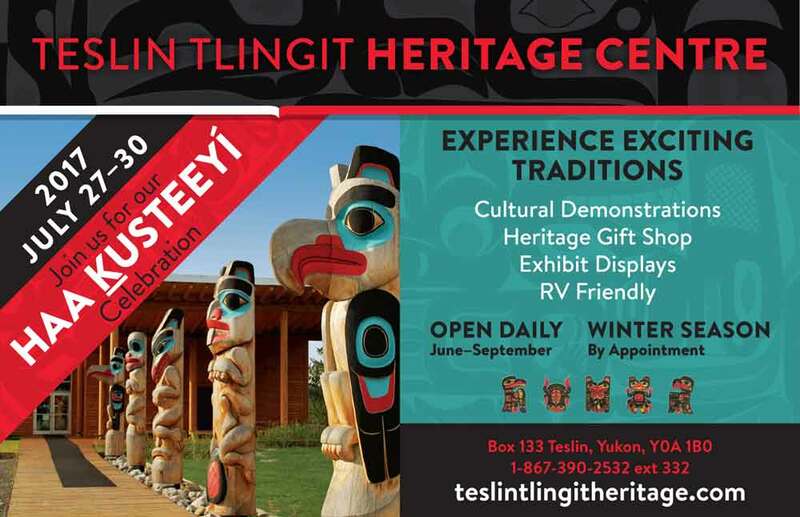 Call (867) 993-6768 for more information on the Centre’s interpretive programs, gallery and walking tours, film presentation and gift shop, or visit www.trondekheritage.com. Visitors can relive the excitement of the Klondike Gold Rush in Dawson City, which commenced with the 1896 discovery of gold on Rabbit Creek (Bonanza Creek) by Skookum Jim, Dawson Charlie and George Carmack. There were several hundred prospectors in the region before the big strike and most of them swarmed over the creeks staking claims long before the stampeders began trickling into the country the following year, when the Klondike River tributaries came alive with the sounds of gold-feverish miners seeking their fortunes. In retrospect, it seems difficult to comprehend how the Klondike discovery could uproot so many thousands of people and draw them north in a frenzied and often irrational pursuit of gold. Yet that is exactly what happened when the words ‘gold’ and ‘Klondike’ captured the world’s attention. The rush to the Klondike from the outside was not a single, instantaneous eruption. It began in the winter and spring of 1897 with a thousand or two individuals, steaming north on the basis of a rumor that gold had been struck in the Klondike. It gained momentum in July 1897 after ships docked in Seattle and San Francisco bearing their cargo of Klondike gold. The massive press coverage recording the event, together with contemporary economic conditions, the mobility of the 19th century labor force and the fact that Klondike gold was placer gold and therefore capable of being mined by hand, made for a volatile mixture that transformed the trickle of the previous spring into a veritable torrent. It is estimated that while more than 100,000 people set out for the Klondike (including the Mayor of Seattle), less than 40,000 actually made it. Between the dream and the reality of arriving was the hardship of transporting tons of goods through harsh wilderness along trails such as the Chilkoot and White Pass, building boats and rafts and ferrying to Dawson City. 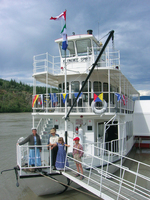 There were other routes just as difficult; the longest was the all-water route by ocean steamer around Alaska’s west coast to St. Michael at the mouth of the 2,000-mile long Yukon River, followed by the long voyage up river by stern-wheeler to Dawson. The dramatic influx of eager cheechakos (newcomers) in 1898 changed Dawson from a seasonal fish camp and log cabin boomtown to the largest city west of Winnipeg and north of San Francisco. By the turn of the century, Dawson was a refined city boasting many stately homes and grand government buildings, complete with such amenities as running water, telephones and electricity. By 1903, many moved on to participate in stampedes to Nome and other points in Alaska. A sturdy government and mining fraternity were left to maintain an aura of big city worldliness until WWI. In later years, Dawson nearly became a ghost town. Each year a few more buildings were abandoned by owners. Floods, fires, vandals, neglect and permafrost caused many buildings to disappear. Over 100 years later, visitors can relive those exciting times, see what the early stampeders saw and experience the feeling of Gold Fever. While some buildings have been restored to their classical splendor, there are just enough dilapidated relics around to give Dawson the character of the days of ‘98. The gold mining industry still flourishes and people flock here drawn by the excitement of seeing where it all began. Dawson’s year round population nearly triples in the summer and the community hosts more than 70,000 visitors. In the cafés, one can see gold miners straight off the creeks right next to visitors from all around the world. Dawson is home to many indelibly colorful characters who are often more at ease here than in a conventional cosmopolitan setting. Characterized as “just another guy in Dawson City," Caveman Bill Donaldson occupies three small caves left over from the gold mining days when miners chipped into the cliff above the river directly across from town. When his friends in Vancouver assured him he’d feel right at home in the eclectic, wide-open atmosphere of Dawson, he came up hoping to find a somewhat secluded residence. After being bet that he couldn’t live in a cave once used for cold storage, Bill made it through the bitterly cold winter and has resided there since 1996, raising chickens and using an exercise bike to run the lights, television, radio, computer and CD player in his approximately 250 square foot dwelling. The subject of a documentary by an award-winning film maker, ﻿Bill is an accomplished furniture maker and has worked various odd jobs including manning the door at Bombay Peggy’s. 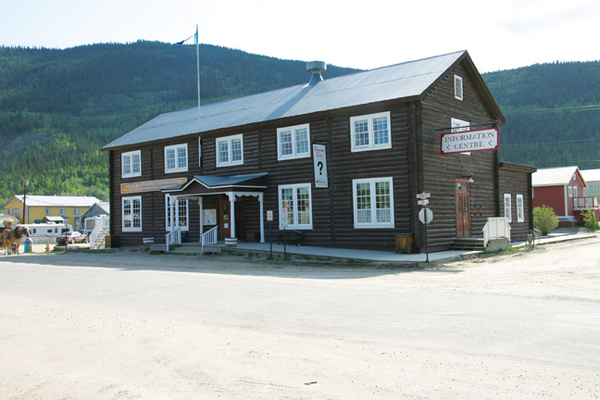 Visitor information on Dawson City events, activities, attractions and facilities are available at the Visitor Reception Centre in the reconstructed 1897 Alaska Commercial Company store located on the corner of Front and King Street. Walking tours with turn-of-the-century costumed guides depart from the VRC on a scheduled basis and video presentations are ongoing. The centre is open from mid-May to mid-September. 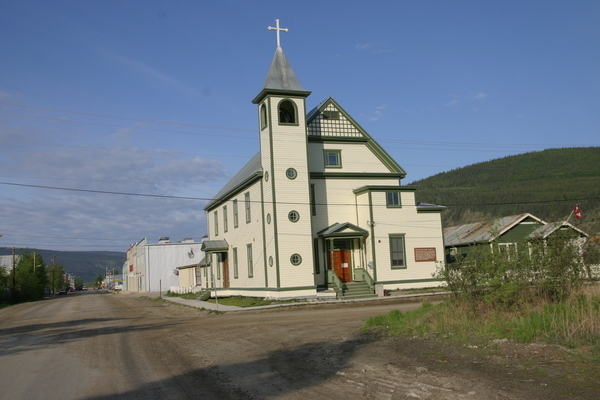 The Dawson City Museum is housed in a beautiful 1901 neo-classical Old Territorial Administration Building and has the largest historical collection in the Yukon. The museum tells the story of the Klondike region from pre-history through the Gold Rush. There is a reference library with photographs and records for genealogical research, a gift shop and theatre presenting award-winning films. On the grounds, the Locomotive Shelter contains narrow gauge locomotives from the Klondike Mines Railway and other steam-powered machinery. For more information, contact the Dawson City Museum at 867-993-5291 or info@dawsonmuseum.ca or visit the website at www.dawsonmuseum.ca. A collection of historic fire fighting equipment is on display at the Volunteer Fire Fighter’s Museum located at the Fire Hall on Front Street and Duke. Jack London’s original log cabin was located on the North Fork of Henderson, 120 km south of Dawson City. London entered the Yukon in September of 1897 as a 21-year old prospector looking for gold. While he didn’t strike it rich, he later turned his Klondike adventures into fortune with his legendary short stories and books. London’s cabin was abandoned after the gold rush. It was rediscovered by trappers in 1936 who found his signature on the back wall, and is now an interpretive centre featuring live presentations, located near the Robert Service cabin. Robert Service became famous around the world for his poetry about Yukon gold miners, with works like ‘The Shooting of Dan McGrew’ and ‘The Cremation of Sam McGee.’ When his 1907 book The Spell of the Yukon and Other Verses made Service a wealthy man, he was able to quit his job and travel to France. Service worked for the Canadian Bank of Commerce and lived in a log cabin on 8th Avenue in Dawson City, which Parks Canada has maintained as a tourist attraction. Following a recitation of Service’s poetry on the front lawn, visitors can view Service's home through the windows and front door. Diamond Tooth Gertie’s is Canada’s oldest casino and offers a unique entertainment experience, including three different Can-Can shows nightly, full bar service, food concession, slot machines, blackjack tables, roulette wheels and more. 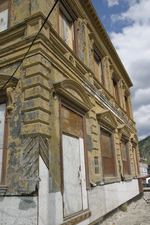 The building was built in 1901 by the Arctic Brotherhood, a fraternal organization dedicated to improving social conditions in Dawson City and other northern mining communities. Over the years, the building was the center of Dawson’s most important social gatherings. After the city obtained title in 1951, it operated as a community hall until 1971, when the Klondike Visitors Association transformed it into Diamond Tooth Gerties Gambling Hall, named after Gertie Lovejoy, one of Dawson’s most famous dance-hall queens of the gold rush era. She got her nickname from having a diamond inserted between her two front teeth. The Palace Grand Theatre was opened in gala style July 1899 by Arizona Charlie Meadows, a Wild West showman who came to Dawson City during the Klondike Gold Rush. Structurally a combination of luxurious European opera house and boomtown dance hall, it is one of the most magnificent theatres ever built. The Palace Grand played host to a variety of entertainment, from wild west shows to opera and when the show got slow, 'Arizona' himself would get on stage and perform shooting tricks for the audience. The building was saved from destruction by the Klondike Visitor's Association in 1959, then donated to the National Historic Parks branch of the Canadian government, who restored the theatre as a National Historic Site in the early 1960s. Tours are offered daily in summer. One of about two dozen gold dredges that worked the Klondike gold fields, the No. 4 Dredge is the largest wooden hull, bucket-line dredge in North America. Ten miles from downtown Dawson, it rests alongside Bonanza Creek on Claim No. 17 (below Discovery Claim), where it ceased operations in 1959. Built in 1913, the giant dredge is now a National Historic Site. Parks Canada offers daily tours which take visitors inside the huge machine. As Dawson is only 159 miles south of the Arctic Circle, it has almost continuous daylight for the months of June and July. A high point of any trip to Dawson must include a visit at midnight to the Midnight Dome from which a panoramic view of the mining creeks, Ogilvie Mountains, ‘60 Mile’ area, Dawson City and the Yukon and Klondike River valleys await the photographer. The hills bloom with over 100 varieties of wild flowers and host an abundant variety of birds and wildlife. For the wilderness lovers, there are many hiking and canoeing opportunities in the Klondike area. Dawson City really has it all: good food, great accommodations, quality shopping, exciting night-life, year round special events, fascinating history, First Nation culture, gold panning, art school and college, music, visual and live performing arts, golf course, museums, gambling, snowmobile adventures, wildlife viewing, camping, northern lights and great hospitality. 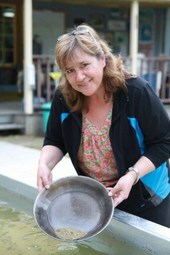 Dawson City hosts many unique and unusual events during the year. In mid-February the Yukon Quest Dog Sled race between Whitehorse and Fairbanks has a mandatory 36-hour layover in Dawson, with activities including the Centennial Ball, with 1898 style dress. The International Curling Bonspiel and Old Timers Hockey Tournament also take place in February. In March, the Percy De Wolfe Sled Dog Race, a middle distance race to Eagle, Alaska and back, features mail stamped “Delivered by Dog Sled.” The coming of spring is celebrated in late March with spring Thaw-Di-Gras. The International Gold Show in late May starts the series of summer events, followed by the gala Commissioners Ball in early June. 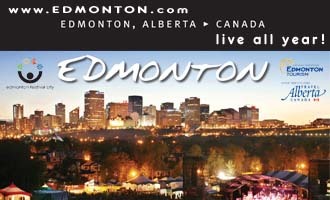 In July there are Canada Day celebrations, gold panning championships and the Dawson City Music Festival. Every two years in July, the Tr'ondëk Hwëch'in First Nation of Dawson City hosts a cultural celebration at the village of Moosehide, located three miles downstream from Dawson and reachable by hiking trail. Discovery Days Festival is held the third weekend in August. One can travel by air to Dawson directly from Whitehorse, YT or Fairbanks, Alaska. Connecting flights are available from Vancouver and Anchorage. There is road access from British Columbia via the Alaska Highway to the Klondike Highway, and from Tok, Alaska over Taylor Highway #5 through Chicken, Alaska and then on the Top of the World Highway #9.